Photograph courtesy the Rex Conway collection. The north side of Toton shed plays host to 7559 with a couple of big Sulzers in the background. D7559 was new to Toton, from Derby Works, during August 1965. After various re-allocations to the Birmingham, Stoke & Preston Divisions, 7559 returned to Toton during November 1970. After almost four years at Toton a move was made to Longsight in August 1974, further transfers took the locomotive to Bescot & Crewe before withdrawal in December 1985. Toton's connection with the Class 25's begins in March with the delivery of D5186 - D5188 from Derby Works, followed by D5183 from Darlington Works during early April. These four locomotives were the beginning of a huge allocation of brand new Type 2's to Toton & Cricklewood, all required to remove steam workings from the Midland mainline. This task had begun in earnest with the Peaks, BRCW Type 2's and Cricklewood's large fleet of diesel multiple units. The Derby Type 2's would be used on the remaining steam hauled freights and in support of the existing diesels. They were also a most welcome sight for the operating authorities following the battering that the locomotive fleet had taken in the harsh winter from January through March. Its April 1963 and almost brand new D5183 awaits its next turn of duty at Toton. D5183 spent three periods allocated to Toton: April - December 1963, February - April 1964 & June 1968 - July 1969 (as allocated to D16). At this time Derby was churning out about seven - eight per month, Darlington managing one or two per month. From the very beginning on the Midland they were used in pairs, perhaps a shadow of the former Midland small engine policy. By July when deliveries had reached D5216 from Derby and D5225 from Darlington, they were handling the majority of the freights south of Wellingborough, many being assisted on the heavier duties with brake tenders. Those freights that remained steam hauled relied principally on Class 5's and Jubilees. One feature of the Toton fleet in these early days is that they tended to be quickly re-allocated to other depots as new locomotives arrived from the Workshops. During July D5203 - D5212 moved south to Cricklewood (14A). Four of these (D5203, 5205, 5207, 5210) returned to Toton in September, in exchange for recently arrived D5213 - D5217. From September 9th Toton's depot code changed from 18A to 16A. One or two locomotives, such as D5228, upon delivery to Toton were immediately re-assigned, usually to Cricklewood (14A) or Leicester(15A). This increasing fleet of Type 2's had a dramatic effect on the withdrawal of the Midland 3F & 4F's, as there were now enough diesels to handle even the lowliest of freights. At Bedford the coal hoist and its supply of steam spares was removed whilst many of its steam allocation headed north to Wellingborough for storage. In October four more moved south to Cricklewood (14A) (D5210, 5219, 5223, 5227), although in trade ten BRCW Type 2's moved north to Leicester (15A), whilst D5390 was loaned to Saltley (21A). By November the first of the restyled Class 25's had left Derby, now in the stylish two-tone green livery, and the unique boilered batch (D5233 - 5238) all went to Toton. Pre-Christmas traffic overwhelmed the diesel fleet leading to much steam activity being noted on the southern end of the Midland mainline. The heavier freights were noted behind 8F & 9F's whilst Jubilees filled in on the extra parcels workings. By the end of the year deliveries had reached D5239 from Derby and D7581 from Darlington. May 1963 found Toton receiving brand new 5193 from Derby Works. Very soon after their intoduction at Toton the Class 25's were coupled to brake tenders to improve their braking capacity. During March 1964 D5193 moved away to Nottingham (16D). In this view of unknowns D5193 is seen early on in its career, possibly at Trent???. If you click on the thumbnails below for the larger views please make sure you view the scan to its fullest extant (after the browser has opened the scan make sure you view it fully enlarged). If not the view will suffer hatching because of the print quality of the original printed image. The scans below were made from a pamphlet kindly provided by Rob Drake. To publicise the construction and opening of the new diesel depot at Toton, British Railways produced a nifty little illustrated pamphlet giving much information. Regretably the throw-away nature of the pamphlet did not lend itself to high quality printing so it doesn't scan very well, apart from the cover. An aerial view of the new depot from the north end looking southwards, clearing showing the fifteen roads. Another view looking southwards, this time centering on the old steam depot. Toton Traction Maintenance Depot was built to provide heavy maintenance of 330 Type 2 & 4 diesel electric locomotives and 70 shunting locomotives. The depot featured fifteen roads accessible from the north side of the shed, only four of these roads were through roads. These four through roads were equipped with pits 230 feet long, each capable of holding three Type 4 diesels. Locomotives requiring light maintenance were handled on these roads. The remaining eleven dead-end roads each held a pit 154 feet long, capable of holding two Type 4 diesels. These roads were used for heavier maintenance and unscheduled repairs. Access to the depot was by folding doors operated manually or electrically. The entire depot was centrally heated and contained a ventilation system to remove diesel exhaust. Used lubricating oil was burnt in the depot boiler to provide heat for the working spaces. In the heavy maintenance section three roads are equipped with four ton capacity overhead travelling cranes, enough to lift compressors, traction motors or train heating boilers. The other roads have one ton capacity hoists for the movement of smaller locomotive parts. Two roads were equipped with reinforced concrete jacking strips allowing locomotives to be lifted off their bogies to allow for cleaning of the bogies and underframes or for maintenance. On the east side of the building adjacent to the four through roads is a wheel lathe for the reprofiling of tyres. Next to this were the fuelling facilities, where two locomotives could be refulled simultaneously, 150,000 gallons of fuel could be stored here. A washing plant was located at the north end of the yard. A close up of the wheel lathe, a Class 25 is ready to have a wheel set reprofiled. A view along one of the access pits, showing a little of the underside of a Class 25. The two road fuelling point. The New Year opened with more deliveries from Derby (D5240 - 5244) and Darlington (D7582 & 7583). These partly made up for eleven machines transferred away, D5183 & 7578 went to the Eastern Region, D5185 to Leicester (15A), D5187 to Saltley (2E), D5197 & 5202 to Nottingham (16D), D5202 to Longsight (9A), D5233, 5236 & 7579 to Derby (16C) and D7581 to Carlisle Kingmoor (12A). Their work on the Midland mainline continued, allowing a number of Ivatt Class 4 2-6-0's to move from Wellingborough to Heaton Mersey, sending their fleet of 4F's onto the storage lines. The workings north of Toton were still dominated by steam, but inroads were occurring here too as the Class 25's became more frequent north of Chesterfield, though invariably at this time they returned south light engines. More arrivals in February (eight Class 25's) and March (nine Class 25's) were met by greater numbers of departures, mostly to Midland depots, prinicipally Derby & Leicester. The transfers in March left Toton with only three of the early batch of the boilered Types 2's (D5183, 5188 & 5232). May and June saw pretty much the same thing, though in June six Type 2's (D5269/70/72/73 & 7592/93) were moved from Toton to Wellingborough (15B). Also saying farewell to Toton were D5274 - 5279, bound for Trafford Park (9E) and some heavy haulage on the ICI limestone services between Peak Forest and Northwich. On June 5th D5275 had been tested on the 6M21 Toton - Trafford Park empties inplace of the more normal 8F, whilst on June 15th D 5274 filled in. Not to be outdone D5279 took an excursion from Derby to the North Wales seaside resorts on June 21st. During May the suburban services out of St Pancras encountered increasing failures to the DMU fleet. A number of Peaks deputised, leading to paired Class 25's filling in for them on certain longer distance services out of St Pancras. They were also employed on more freight and parcels workings. The transfer of some Type 2's to Derby (16C) and Nottingham (16D) allowed for their use on the local passengers to Sheffield, alongside DMU's and a dwindling number of steam powered services. September saw the delivery of Darlington's last Class 25 D7597 to Toton, though its stay was very brief as it quickly moved on to Nottingham (16D), presumably its boiler being of more use on the passenger locals than Toton's endless supply of coal trains. Another blow to steam in the area was the closure of Wellingborough's large turntable, any 9F's now arriving here had to turn on the triangle at Bedford. More arrivals in October reached a new number series with D7500, missing temporarily was D5299, intended for test bed use, this being cancelled as the problems with the Class 47 power units became the focus of attention. During October six Type 2's including D5243 - 5247 from Toton were transferred to the Southern Region, it is uncertain whether this actually took place apart from on paper. The trend continued with the Type 2's staying only briefly at Toton before moving on to other Midland depots. A continuing shortage of serviceable DMU's on the St Pancras suburban services found more Type 2's filling in with scratch sets of coaching stock. A minimal series of transfers in November was followed by a large number in December, mostly within the Nottingham Division, though nine did move south to Cricklewood (14B). Six (D7500 - 7505) were re-allocated to Burton (16F), a new refuelling shed being built for this purpose. These latest changes saw Cricklewood's steam facilities withdrawn on December 13th, its seven remaining steam locomotives were moved to Willesden. There was now little steam working south of Bedford, principally 8F & 9F's on coal trains, usually to Goldington Power Station and Holbeck allocated Jubilees on workings that came up to the capital with fish & parcels traffic. The Type 2's would soon take hold of the Goldington coal workings, though steam would remain awhile longer on this service. So common now were the Type 2's that there were now no more duties for the 4F's at Derby, Nottingham, Toton & Burton. On the Toton - Watford/Willesden freights the Toton machines were now changed at Northampton, many of these workings were unbalanced leaving crews & locomotives to return northwards light engine. D7506 - 7510, 7512 - 7514/18/20, 7570/82/94/95. A re-organisation of the allocations for the LMR found Toton's fleet being now allocated to the Nottingham Division (M16). January's transfers were few, with three (D5239/45, 7508) heading to Saltley (2E). Out and home workings continued to Wellingborough, Northampton and Birmingham (the through services to Willesden were discontinued). Increasingly more were heading north, taking over trips to Tibshelf, Blackwell & Kirkby, the Toton - Avenue Sidings trips were quickly 100% dieselised. The end of steam at Toton was near, only awaiting the arrival of Brush Type 4's D1806 - 1836 from the builders, these would see much use on the Toton - Peterborough coal trains, until they arrived the Type 2's worked these as far as Colwich. February, March & April saw new arrivals running about six per month, transfers away kept Toton's fleet reasonably constant. The 7th International Congress on Combustion Engines held in London during the last week of April led to BR exhibiting ten of their new diesels at Marylebone Goods Yard on April 30th & May 1st. Amongst the exhibits was Toton's brand new D7544. A BR speaker at the Congress anticipated that steam would disappear from BR sometime during 1967. On the Midland, especially at the south end, the diesels were already very much in charge. A tally of the steam locomotives at local depots looked bleak; Wellingborough - 17, Leicester - 24, Coalville - 17, Burton - 34, Derby - 42, Nottingham - 1, Toton - 8, Annesley - 61, Westhouses - 41 and Kirkby - 43. New deliveries to the East Midlands depots were clearly intended to allow the diesels now to march north of the Trent. More new arrivals in May & June were balanced by a lesser number of transfers away, the elder statesman of the Type 2 fleet at Toton was now D5232. By July & August deliveries were down to about three/four per month with a like number of transfers away. A visit to Westhouses depot at the beginning of August found seven diesels present, five Brush 4's and Type 2's D7535 & 7548. Seven 4F's were in store with only one 4F and a Jinty in steam. 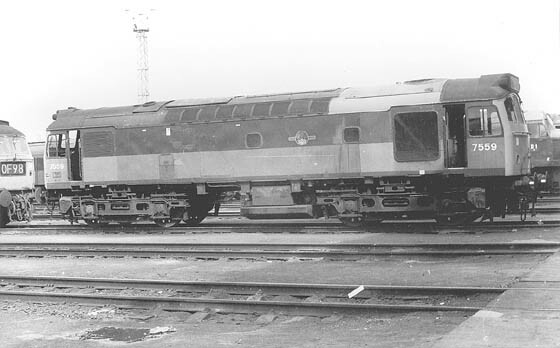 Toton's Type 2's were now being used on the recently diverted Middlesborough - Banbury iron ore trains, locomotives were changed at Burton for the run south to Banbury. This service had formerly used the Great Central route. On the GC Toton's Type 2's became more common on the few remaining freight workings south of Nottingham, allowing more Colwick steam turns to be phased out. The end of the summer timetable saw half a dozen Type 2's transferred to the Leicester Division (M15), the only new deliveries were D5299 & D7561, the former delivered as a standard Type 2, its intended purpose as a test bed for a new Sulzer power unit having been shelved. D7500 - 7502, 7504 - 7507, 7509 - 7511, 7513, 7521, 7523 - 7535, 7538 - 7540, 7542 - 7550, 7552 - 7554, 7556 - 7561, 7571/77/78, 7581/83, 7594. Just arrived on temporary loan at this time was Brush Type 2 5588 for crew training on freights to & from the Eastern Region, particulary those from the Sheffield area. The training locomotive was changed frequently with 5821 & 5848 being noted. Saltley also received an ER Brush Type 2 for crew training, to cover duties over the NE/SW mainline north of Birmingham. Deliveries were now dwindling with only D7562 - 7565 received in November and December. Transfers were also very light, during December D5253 & 5256 (as part of D5248 - D5256) were swapped with Thornaby for six BRCW Type 2's, though the move was shortlived and possibly not all the transfers actually took place. Steam was now so scarce in the Bedford area that many of the buildings at Bedford depot were demolished during November, with a ball & chain levelling the concrete coaling plant. Steam venturing south of Wellingborough now required enough coal & water to allow for a safe return to Wellingborough's steam facilities. Annesley shed closed on January 3rd. Further south indifferent and lack of maintenance for the diesel fleet caused serious shortages on services out of St Pancras. The Peaks were pulled from the express fitted freights to cover the passenger services, their place being taken by any available Type 2's. These shortages led to much additional activity on a number of Sundays. Deliveries in January ended the big run of locomotives planned for Toton and the Nottingham Division, with D7566 & 7567 being the last so allocated. By early February the maintenace crisis was easing, though severe weather did not help matters. When the ex GC carriage sidings closed at New Basford on January 15th stock for the Nottingham Victoria services was provided by Nottingham Midland carriage sidings, with Type 2's using the recently installed connection at Netherfield Jct to make the transfers. Transfers through March & April increased Toton's Type 2 fleet by ten locomotives, though the overall fleet size would soon swell with a big block of English Electric Type 1's reaching Toton from Vulcan Foundry's production line. At this time the 'M16' designation became 'D16'. The Toton/Burton - Banbury freights now became diesel hauled throughout, either using Type 4's or paired Type 2's. During May three more new Type 2's were delivered from the last batch to be built at Derby, D7650 - 7652. D7650 was quickly lent to Willesden for crew training, prior to delivery of their first Class 25's. By June the only steam locomotives at Toton were six withdrawn Class 2 78xxx machines. After a quiet summer Westhouses depot (16G) closed to steam effective October 3rd, and in a sign of the new BR corporate image the first of Toton's Type 2's started to receive blue livery. A temporary visitor to Toton during November was English Electric Type 3 D6750 for crew training. Re-allocations to/from Toton in the last quarter were minimal. Nottingham (Midland) shed closed on November 21st, like many other locations the few remaining diesels found a new home by stabling at the Carriage Sidings. A short distance away the career of Colwick shed was almost over, early December found over forty diesels regularly stabled there, usually half of these were Type 2's. An equal number of steam locos were present, though half were on the scrap roads and those in steam had a very bleak future. Although this view is not dated it is presumably taken during 1966, when D7634 was allocated new to Tinsley during April, and the paint still appears remarkably fresh in this view. No doubt it would have arrived at Toton on an inter-regional freight perhaps from the Sheffield area. As the last full year for BR steam commenced, the nearest depots to Toton still with an allocation were Colwick (16B - 18 locos), Kirkby (16E - 9 locos) & Westhouses (16G - 3 locos), naturally 8F's were predominant, with a few Class 5's, though Westhouses held only Jinties, on hire to the local colleries. It would be left for Kirkby shed to be the last in the area to have an allocation of mainline steam locos, by late January only seven/eight 8F's remained. Toton would have the honour of receiving the final few Class 25's built by Derby with D7671 - 7677 delivered between February and May. However their stay here would be brief as the LMR worked feverishly to re-allocate the diesel fleet to eradicate steam from the north-west. 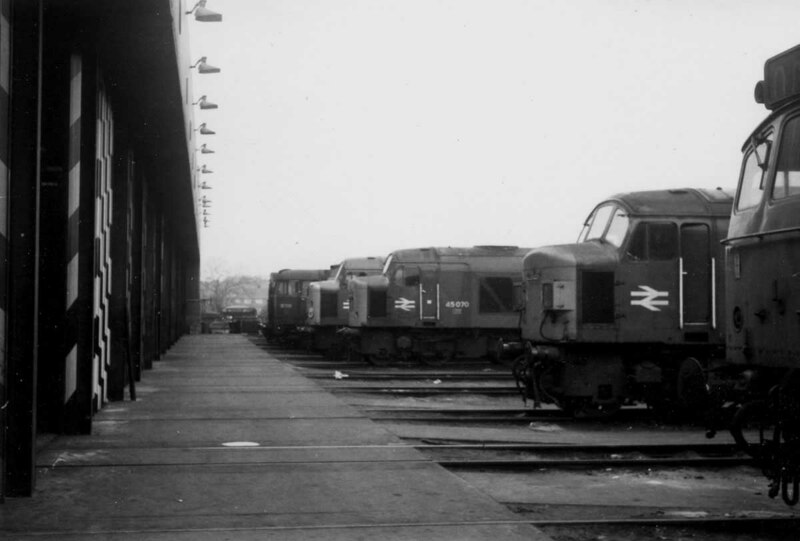 A considerable number of Class 25's were sent to Saltley for use in the Birmingham area (including some from the Eastern Region), allowing the release of Class 24 & 40's to Crewe (& points north). Considerable moves/exchanges were made between Cricklewood, Toton & Saltley, apparently Saltley's fleet was kept non-boilered at this time. The Midland mainline also saw an increasing use of Brush Type 4's, a type at this time not a frequent visitor south of Wellingborough. During July Toton's newest Type 2's D7671 - 7677 were all transferred to Carlisle (12B), supposedly to assist in the replacement of Kingmoor's steam fleet, though more likely to cover Carlisle's ailing MetroVicks and Claytons. August and September saw over seventy re-allocations involving the Class 25's, many affecting Toton's fleet, some were a straight swap - D7568 - 7573 went to the Eastern Region in exchange for D7627 - 7632, and Toton also gained a dozen BRCW Type 2's at this time. A second batch of BRCW Type 2's were received by Toton allowing for another six Class 25's to move on during October, all to depots in the north-west. At the same time the Midland main line saw a greater use of paired Type 2's on the longer distance passenger workings. Several more Type 2's moved to the north-west in November. Another half dozen exchanges took place in December. 7500/01/04/05/07 - 12/14 - 40/42 - 45 (47 locomotives out of Toton's total fleet of 190). In February the Midland lines swapped five boilered machines for seven of the later series (7500/01/03-05/07/08). Further transfers took place in May, fourteen Type 2's (7509-12/14-23) moving to the Midland lines, replaced by a number of Class 20's transferred from the Eastern Region. Locally freight traffic handled by Kirkby MPD had dwindled considerably, Toton supplying the locomotives for these workings. More losses occurred in June, three to the Midland lines and seven to Longsight, partially covered by Class 20's moving south from Scotland. Strangers to Toton were D5714 at the end of March and D401 on April 23rd, making a brief visit from Derby. Another allocation re-alignment took place effective June 17th when the Leicester Division (D15) and Midland Lines (ML) allocations folded into the Nottingham Division (D16), thus bringing back many of the recently 'lost' Type 2's. In July to mark the final withdrawal of steam twelve of Toton's 25's moved to the Liverpool Division (D08), three (5193/95/96) were boiler equipped. Finally the migration of the Class 27's north to Scotland had begun, as some left Toton for the north these were replaced by others from Cricklewood and Leicester. Toton also gained many re-allocated shunters, it was disposing of its large fleet of Crossley/Blackstone engined Class 08's. In the last quarter of the year fourteen Type 2's moved on, to the Willesden, Birmingham and Preston Divisions, partially replaced in December by 5225/26/27 & 7656-7659. Strange shed-mates during November saw the arrival of various Class 50's for tyre turning & engine testing at Toton. 7600/01/16-23/27/28/52/54-59, Toton's total fleet was 383. A couple of transfers away in January were offset by nine Class 20's being received. During March another ten Class 27's headed north to the Scottish Region, with at least six Class 20's coming south in exchange. A new passenger working for the Type 2's was the handling of the Yarmouth - Birmingham west of Leicester, previously worked throughout by ER Class 31's - on the return working a number of the Class 31's had run out of fuel east of Ely. This change in the locomotive diagram would avoid this. With the introduction of the summer timetable during May Toton gained thirteen Class 25's (all non-boilered) and four Class 20's. Although still booked for paired Class 25's, the Burton - Banbury freights were frequently handled by pairs of Class 27's as well. These workings were shortlived as nine Class 27's moved north to the Scottish Region during June, exchanged for 7602-05/07/08, with an additional four Class 20's arriving at Toton. Also moving south were seven Type 2's to Willesden (D01), including boiler equipped 5183/84/85. The use of the Type 2's on freight workings generally found them more common on turns to the south and west. During June the 38 turns at Westhouses and 64 turns at Kirkby featured only one Type 2 diagram, Colwick's 20 turns required a pair of Type 2's whilst Burton required six of them. As a sign of the dramatic changes, at Derby the old, represented by the huge steam shed was swept away, whilst the new, the power signalling supported by the new Derby Power Box came into operation. During July another common sense move brought the remaining Willesden allocated Class 20's (8000 - 8005) to Toton, in exchange for 7529 - 7533. Six Class 25's and two Class 20's were transferred in during October, by this time the Burton - Banbury freights were usually hauled by pairs of Class 20's. For Class 25's arriving at Northampton from the Leicester line with southbound freights, these workings were taken over by electrics with the Type 2's regularly filling in on local Bletchley duties until taking up the return portion of the original diagram. Late October and early November saw twelve more Class 27's headed north, with a like number of Class 20's received by Toton to cover this. At this time contractors finally started to lift the closed ex-GC line between Rugby & Leicester, Toton 25's were used on the work trains. 7601/04-08/16-23/47-59, total fleet strength was 386. February & March saw the remaining seven Class 27's head off to Scotland, again their loss was covered by incoming Class 20's, their familiar duties in the Coalville area were now covered generally by Class 20's. Colwick shed (16B) closed on April 13th. Transfers during the spring & summer for Toton's 25's was minimal, a trickle going north to the Liverpool Division (D08). On May 25th 5235 & 7651 worked a Derby - Blackpool day excursion. The Nottingham - Llandudno again featured Class 25's though the odd Class 47 crept onto the workings. Typical examples were 7523 & 7528 on June 20th & 7656 & 7607 on July 18th, this day also found 5230 & 7507 on a Leicester - Blackpool North working. On an unknown July Saturday 5241 & 7652 worked a Derby - Llandudno charter, passengers then taking a cruise to Liverpool, crossing with a similar charter from Coventry going in the other direction. The Type 2's took the Coventry party back to Crewe, where the locomotives exchanged trains, picking up the Derby trippers coming back from Liverpool. During September extra coal traffic from Three Spires Jct found Toton's 25's covering some of these duties to Immingham, Cheltenham, Watford & Wellingborough. On October 11th Kirkby-in-Ashfield shed closed, locomotives had been supplied by Toton, predominantly Class 20's. The last locomotives to leave Kirkby were 8081 & 8155 on the afternoon of 10th. Authorities in November worked to bring an allocation of Class 25's to Newport (86B) for the first time. This resulted in a number of Class 25's shifting between the Birmingham, Liverpool & Nottingham Divisions. Toton's Class 25 fleet at the end of 1970 was 5224 - 5252, 5266 - 5270, 7500 - 7528, 7556 - 7562/87/88, 7604/05/08/15-17/20/49/51/55/57. A fine study of 7616 at Toton on May 30th 1970, seen here in fading two-tone green livery with full yellow ends. Transfers in the first half of 1971 were minimal, two in February & May and one in March. Toton did however say farewell to its allocation of Class 46's as the last three moved to Bristol in May, their duties now covered by Class 47's. A WR duty frequently used to return LM locomotives north was the 8.02 Carlton Sidings - Manvers Main, 5236 & 7503 were used on June 24th, 5242 & 7512 two days later. On June 29th Toton's 5242, accompanying 7598 worked the 02.29 Toton - Eastleigh freight through-out, returning north with the 14.30 Eastleigh - Washwood Heath. More important work fell to 5233 & 5226 on June 12th, handling the 17.57 St Pancras - Nottingham, the previous day 5240 & 7615 hauled the Saturday extra Nottingham - Llandudno. At the end of July St Blazey received its first Class 25's, though these transfers had no effect on Toton's fleet. However in September 7657 did head south-west to Newport (86B). A number of transfers took place in October between the Nottingham, Birmingham, Liverpool & Manchester Divisions. This was at a time when one hundred & twenty one locomotives were withdrawn. Elsewhere March depot were more than happy to send Toton's 25's into GE territory, typically on the 8L55 Whitemoor - Forton and 8J92 return as well as frequently being used on extras to Hitchin, Letchworth & Chesterton Jct. On November 27th a head on collision north of Sharnbrook seriously damaged Toton's 5250 and Class 47 1623. Two ballast trains were involved, colliding on the up fast line, distributing much of their trains across all lines. The damaged locomotives were moved to Bedford, being noted there over Christmas. A short while later three other Toton machines were involved in a fatal collision at Lenton South Jct on December 16th. 7605 was in charge of the the 06.30 Liverpool - Nottingham parcels whilst 8115 & 8142 were in charge of a Bestwood - Derby freight. The two trains met head-on at the ladder crossover at Lenton South Jct, regrettably two drivers and a guard were killed. 7605 was removed to Beeston Freightliner terminal before moving to Derby Works for evaluation. However like 5278 at Peak Forest it had suffered severe damage to both cabs as well as much other damage. Toton's Class 25 fleet at year end was 5224 - 5250, 5266 - 5270, 7500 - 7524, 7558 - 7564, 7604 - 7608/20/26/47/49/51, part of "D16's" fleet of 328 locomotives. The New Year began with Toton sending sixteen Type 2's to the WR, split between Newport (86B) and Laira (84A), with a solitary 5230 going to Bristol (82A). Nine Type 2's were received to cover these transfers. However the commencement of the miners strike on January 9th saw much of Toton's fleet sidelined, especially the Class 20's. By the beginning of February accident damaged 5250 & 7605 were at Derby Works, 5250 in the erecting shop and 7605 in the yards. The coal miners strike, which had such a devastating impact on the railways in general and Toton in particular ended during the middle of February. After evaluation by the authorities at Derby Works the heavily damaged 7605 was withdrawn during March, the first mainline locomotive to be struck off Toton's diesel allocation. Transfers between March & May were minimal, mostly between LMR depots though 5228 & 5229 were sent to Leeds Holbeck in April. Joining Toton's allocation in April was Class 31 5584, to train Toton drivers on these machines for inter-regional workings from the ER. By May the remains of 7605 had been scrapped at Derby. A Toton machine far from home on June 10th was 7647 (with 7573) working the last leg of a Paddington - Barnstaple charter from Exeter to Barnstaple, 7647 still carrying a scruffy green livery with small yellow ends. Transfers during the summer sent a batch (7517 - 7524) of Toton's Class 25's to South Wales and Willesden, exchanged in part by three received from the ER (7568/71/72). The end of the summer season brought seven Class 25's to Toton whilst a similar number went off to the Liverpool & Manchester Divisions. 7500/01 made the long distance transfer to Haymarket in October. Locally the return of the seasonal sugar beet traffic found Toton's Class 25's diagrammed for working these trains west of Leicester to the processing plants in the West Midlands (Kidderminster & Allscott). However with certain Midland drivers now familiar with Classes 31 & 37, through workings by these ER machines was frequent. Five more Class 25's were transferred in during December. New arrivals at Toton in January were 5601 & 6773, on loan from the ER for driver training, these locomotives were frequently exchanged during the following months. Transfers throughout the summer were minor, prinicipally exchanges with other LMR depots. Late in August the first Class 25's were renumbered, initially those being outshopped by Derby Works. Transfers away from Toton in September included 5233/34 to Haymarket and 5239 - 5242 to Tinsley. Transfers for the closing months of 1973 were between LMR depots. From the days of an Instamatic 100 camera, a panoramic view of part of Toton yards, as a battered green livered Class 40 heads north up the main line back to the Eastern Region, February 1973. Getting to Toton in those days meant breaking out the bike for a sixteen mile round trip, or if funds were available, the Trent Bus Company's Derby - Nottingham (via everywhere) service might be used. The cavernous interior of Toton depot provides the backdrop for 1 'Scafell Pike', seen here on February 23rd 1973. A fine portrait of D4 'Great Gable' at Toton, probably in the late 1960's. The locomotive has spent almost a decade hauling coal around the East Midlands, its workings bounded by Birmingham, Tinsley, Peterborough & Wellingborough. One presumes that the task of replacing the brake blocks on Toton's locomotive fleet was something akin to the painting of the Forth Bridge, it never ceases!! With a good sized stack of blocks in the foreground 5 'Cross Fell' undergoes some sort of maintenance on February 23rd 1973. 8 'Penyghent' receives a good soaking as it moves north past the cement sidings with just a brake van in tow on February 23rd 1973. Activity in the first three months was minimal, though a survey of the rapidly decreasing fleet of green liveried locomotives found the Toton had green liveried 25102 & 25218. Late in March a maintenance and workshop supervisory dispute at Willesden found many of the visiting Class 25's, including those from Toton, being borrowed for all sorts of local duties. Not that Toton's machines were not well travelled already. On March 31st the 09.20 Birmingham - Poole had 25095 (TO) & 25259 (BS) as far as Reading. A few transfers were made in June, 25098 being swapped for 25302 whilst 25137 made a brief foray to Willesden. The summer season's first Nottingham - Llandudno featured a Class 47, but to make up for it on June 7th it was doubleheaded behind 25129 & 25131. On 21st green liveried 25102 made the Llandudno run. Other workings typical of the summer season were June 14th's 25081 (TO) & 25044 (SP) worked the Birmingham New Street - Yarmouth whilst two days later 25054 (LO) & 25120 (TO) took a train load of senior citizens from Leamington to Aberystwyth. On June 21st 25095 (TO) & 25090 (TI) worked a Blythe Bridge - Llandudno relief. Double headed Toton trips to the seaside in July included 25212 & 25299 on a Leicester - Skegness holiday relief on July 5th and 25122 & 25131 on a Coventry - Yarmouth a week later (12th). The summer of 1975 brought a considerable shake up in the locomotive fleet, particularly a major inroad into the Class 24's and the storage of many of the pioneer diesels, including some of Toton's early Class 20's. The Class 25's were not severely impacted by these changes, the fleet remaining about the same size. October/November saw Toton sending its newer machines (25299, 25302) to Crewe in exchange for some elderly boiler equipped machines (25047/49/66), during November 25092 was sent packing to Inverness in exchange for 25239. Early in January green liveried 25102, along with 25100 moved to Crewe, no doubt to cover the ever dwindling Class 24's, again during February/March only a few transfers within the LMR affected Toton. On April 8th the 19.42 Tutbury - Tring freight in charge of 25124 & 25132 suffered derailment of twenty wagons north of Leighton Buzzard due to a broken wagon spring. The locomotives were undamaged but both slow lines were blocked. Typical workings for the summer season included 25075 & 25210 on the 8.28 Birmingham New Street - Yarmouth (May 29th) and 25113 (KD) & 25125 (TO) on June 19th's Walsall - Yarmouth. The Scottish Region cascaded some of its elderly class 25's on to the LMR. Toton received 25029 in exchange for Eastfield receiving 25239. During July 25092 was sent to Inverness whilst the start of Leicester's holiday week found the only Class 25's in use to be from Cricklewood & Bescot depots. July 10th found the Nottingham - Llandudno double headed by 25205 & 25074, whilst on July 26th 25073/074 (both TO) were in charge of a Leamington - Aberystwyth charter. More unusual work involved a Long Marston - Derby test train including a 50ton Warflat and Test Coach 1, hauled by 25205 (1st) and 25095 (27th). Transfers during the summer months remained minimal. During September a sign of the everchanging times greeted Toton when the first of the Class 44's was withdrawn, 44010's withdrawal was however very brief, it was re-instated when 44001 was withdrawn in October. Eight Class 25's moved to Toton during October, including three traded from the Scottish Region, 25094/096/213 came south as 25037 & 25078 moved north. This was partly to assist in the ScR in covering ten recently stored Class 24's. 25037 had been the elder statesmen for a long time at Toton until the recent arrival of 25029. On October 2nd 25075 & 25076 were in charge of a Buxton - Blackpool illumination special. Despite Toton's large fleet of Class 20/25's, its obviously a day for the big Sulzers at Toton on November 20 1976 as Class 44/45/47 predominate. Not quite sure of the date on this one, but another line up at the north end of the shed. 25205/206/207/210-214/218, 25254/258/267 - 270/280, 25303. The first of Toton's fleet to be withdrawn that had not sustained any type of damage was 25029 during August 1977. The unfortunate machine is seen here in better days at Millerhill on June 6th 1976. Again within days of this photograph being taken 25026 was transferred from Haymarket to Toton, exchanged for 25239. By January 1978 Glasgow would have scrapped 25029. January through April saw 25092, 25173, 25189 & 25193 moved to Cricklewood, with only 25264 arriving at Toton. 25057 & 25075 went visiting the seaside on April 11th in charge of a Liverpool - Bangor excursion. Late in May 56031 arrived at Toton for crew training. On June 6th the 09.35 Carlisle - Nottingham and 15.52 return was worked south of Leeds by 25124 (TO) & 25159 (CD) instead of the more normal Type 4. Adventures of sorts befell 25218 on June 22nd when it covered as the standby locomotive for 25221/222 on Royal Train duty, reaching as far west as Porthmadoc as the Queen celebrated 25 years of rule. During August Toton's 25029 was withdrawn, the first of the Class 25/1's to be withdrawn that had not sustained any type of accident/collision damage. August & September continued to see Toton's 25's used in the London area, particularly on the block cement train workings emanating from plants alongside the WCML. On September 3rd the 09.20 Paignton - Nottingham arrived ninety minutes late at Birmingham New Street behind 25129, which was replaced here by 46046. October & November saw eleven Class 25's move to Toton, including the block of 25308 - 25313, whilst six moved to Cricklewood and one to Eastfield, 25096, which was then promptly stored! Withdrawn 25029 had arrived at Glasgow Works by the end of October, presumably to become a parts source. A fine portrait of 25094 at Toton sometime during 1977. The last of the evening light catches 20037 on May 17th 1977 as it moves forward from the ground signal, into the maze of tracks at the north end of the depot. The evening Celanese tanks arrive from Spondon on September 5 1977 behind 44009 'Snowdon'. The train would do a reversal here, backing into the lines alongside the depot, later (I think) going forward to Tinsley, though probably not behind the Class 44. The New Year opened with 24137 arriving at Toton for use in rerailing exercises. It had arrived as the 9L40 4.00am Bescot - Toton on January 6th, on 14th it was noted lying on its side! Transfers in the first quarter of 1978 were minimal, 25313 to Springs Branch, replaced by 25301 from the Scottish Region & 25111/116/173 to Cricklewood. During May over thirty Class 25's were shuffled around, but none impacted Toton. A Leicester - Hereford charter on May 20th utilised 25107 & 25270. The following week the summer season opened, on May 27th 25213 worked the Nottingham - Llandudno whilst the 08.02 Walsall - Plymouth started out behind 25129 & 25136. On June 11th a Wellingborough - Aberystwyth ran behind 25131 & 25310. June 25th's Leicester - Porthmadog used 25148 & 25118 (TO). During July three more Class 25's moved to Cricklewood. The opening of the Mountsorrel Stone Terminal on June 24 found many of its workings diagrammed for paired Toton Class 25's. Late in July 24137 was towed away to Doncaster Works, picked up by a consist that included 24087 & 24133 also making their last journey. Transfers in October and November were minimal, just a couple of locomotives swapped between Cricklewood & Toton. One swapped in November was 25279, which was noted on December 3rd in charge of the 18.10 Glasgow - Liverpool south of Preston. On November 8th Toton's 25249 ran a trial trip to the soon to be opened GLC Freightliner Refuse Terminal at Brent. The unusual pair of 25258 & 31299 were in charge of a special Mountsorrell - Radlett working on December 16th, on the return working they became derailed near Radlett, blocking the slow lines for seven hours. That same day an unknown Class 25 with nine Mk 1's covered for a failed DMU on the evening Derby - Matlock paytrain services. The train lost time due to the extended turn round times required to run the locomotive round. Whoever built the Derby - Nottingham A52 dual carriage road left the rail enthusiast with grandstand seating from the south side of the highway embankment! Here on May 10th 1978 weather-stained 25258 & 25320 prepare to head north with another long rake of coal hoppers. 25258 spent over ten years allocated to Toton, after initially starting out at Tinsley. With an interesting selection of scrap cars in the background 20151 & 20196 marshall another train load of coal on May 10th 1978. A pair of ER Class 37's 37127 & 37103 head north to refill a lengthy set of merry-go-round coal wagons, May 10th 1978. 25074 (TO) & 25071 handled the Nottinghamshire Collier railtour on February 10th, working the outward leg from Marylebone, passing Toton's 25118 & 25125 on engineering work near Aylesbury. A stranger to Toton on March 20th was 24063, a machine with less than a month left in service. During April 25309 - 312 moved south to Cricklewood. April 16th found 25040 & 25122 (TO) in charge of a Walsall - Aberystwyth special, whilst another charter from Marylebone, this time to Dinting started out with 25128 & 25141, the 25's exchanged at Birmingham New Street. Further change was in the air with 56040 arriving at Cricklewood on May 31st for crew training, 56049/50 would soon follow in that capacity. On May 26th the summer timetable kicked off, 25130 & 25135 in charge of the 08.02 Walsall - Yarmouth. A well attened Open Day at Toton on June 9th found thirteen Class 25's present. July happenings included 25264 & 25267 on a Leicester - Paignton relief (14th), 25134 (TO) & 25140 from Birmingham New Street on a Manchester - Bath special (15th) and remarkably 25129 on the diverted Up Manchester Pullman (26th), diverted into St Pancras because of the Kenton mishap, which involved the 20.33 Toton - Willesden freight derailing in the early hours. A Leicester - Blackpool featured 25248 & 25280 (28th), whilst the same day's Nottingham - Llandudno used 25130. August happenings included 25124 & 25132 on the 08.28 Birmingham New Street - Yarmouth (4th), 25134 & 25270 on a Birmingham New Street - Plymouth relief (7th), being relieved at Bristol only to take over a Plymouth - Liverpool relief, worked throughout including the delights of a pair of 25's on passenger work up Lickey incline. 25325 & 25321 (TO) filled in for a pair of Class 20's on a Skegness - Derby (4th). More seaside working included two trips from Birmingham New Street, to Barmouth with 25032 & 25321 (26th) and to Aberystwyth 25101 (TO) & 25158 (26th). 25275 was in charge of the 10.18 Birmingham New Street - Norwich on October 20th. Also during this month 25310 - 25312 arrived at Toton from Cricklewood. 25260 receives attention in the cavernous depths of Toton depot on June 9th 1979. If my allocation history is correct 25260 was never allocated to Toton. Several hours of heavy snow have fallen on the East Midlands on January 20th 1979. Toton depot has not escaped the impact of the white stuff as 20040 & 08334 stand in the snow. On June 9th 1979 Toton held an Open Day featuring many of the locomotives that were allocated to the depot. One such machine was the first of the Class 20 fleet, hiding away at the end of a long line of locomotives, and not immediately obvious as being the first of the Class under its TOPS number 20050. Another snowy day view from January 20th 1979, this time of 20075, which has just brought two fuel tankers close to the storage tanks at the south end of the depot. Another view from the snowy January 20th 1979 as 20168 & 20158 move slowly south in some fine snowy weather. 20158 still carries green livery, though the yellow nose end appears freshly painted. Presumably the cab heaters in 20168 are cranked up high. Seventeen Class 25's were re-allocated during January, none affected Toton's allocation. On February 17th the 20.25 Euston - Manchester became completely derailed (except the locomotive) near Bushey. Coming to the clean-up and replacement of track and structures were eight Class 25's including Toton's 25130, 25182 & 25279. During March Crewe sent Toton 25093/094 & 25139, Toton then sending 25309 - 25312 to Cricklewood. A sporadic working for Toton 25's was the 13.10 Peterborough - Crewe parcels, also frequently hauled by Class 31's. March 29th found 25038 & 25073 (TO) taking over at Birmingham New Street from a pair of 31's on a charter, bound for Derby/Sheffield and across the Pennines to Manchester, before heading back to Birmingham. April Fools Day found 25264 in charge of a Coventry - Aston Villa football special, whilst en-route the match was cancelled due to a waterlogged pitch, 25264 returned its cargo to Coventry and lived to fight another day. Bescot swapped 25143 for 25212 during May. The arrival of the summer timetable on May 24th brought out the usual Class 25 workings, 25248 (TO) and 25274 on the 08.02 Walsall - Yarmouth. Another seaside special, this one on June 15th used 25129 (TO) & 25272 on the 09.06 Birmingham New Street - Bridlington. The first week of June saw the withdrawal of the through evening Toton - Willesden freights (via Market Harbrough & Northampton), leaving only five up & down workings over that route. Of these remaining workings only one continued to start/end at Toton, the 00.24 Toton - Bletchley cement train. During that same week, on June 2nd, 25118 hauled the last of the Class 507's (507031) from Derby C&W to Birkenhead. 25093 disappeared off to Cricklewood during July whilst 25254 & 25258 handled the 08.02 Walsall - Yarmouth on July 15th, a relief being provided by 25143 & 25129 (TO) as it was Leicester holiday week. Two more locomotives, 25094 & 25101 headed south to Cricklewood in August. 25301 (TO) & 25290 went for a thrash in the south-west in charge of a Birmingham New Street - Paignton relief on August 22nd. 25038 & 25073 (TO) were back on railtour duty on October 5th working a Marylebone - Barrow Hill/Doncaster Works charter throughout. The end of the summer timetable brought a major upheaval to the locomotive fleet, caused by a surplus of ageing motive power and a downturn/move away from wagon load freight. The Western Region rid itself of its Class 25's whilst the Scottish Region pruned its fleet, consequently the LMR was the recipient of many Class 25's, some in good mechanical condition, others fit only for scrapping. 25074 (Sept) became Toton's first casualty since 25029, swiftly follwed by 25026 (Oct) and 25121/122/127/137 (Nov), 25122 ending its days at Newton Heath. Of note was the arrival of 25026 from Haymarket, withdrawn immediately by the LMR, six other Class 25's arrived to cover those withdrawn whilst three moved on to Springs Branch. In total twenty eight Class 25's were withdrawn between September & November, other casualties included the last Class 24, 24081 and the final three Class 44's still active at Toton. 25074 had been condemned at Springs Branch and moved on November 21st to Swindon with four others. Likewise Spring Branch allocated 25103 was condemned at Toton and was stored there. On November 8th the 15.17 York - Swansea arrived at Birmingham New Street behind 25320 & 31213, regrettably the better machine, 25320 was removed here. A month later on December 3rd 47443 caught fire near Sharnbrook on the 04.27 St Pancras - Derby, after the Fire Brigade had doused the flames, not an easy task due to the remote location where the Class 47 expired, 25139 arrived to take the whole train forward. As the year closed out 25264 was withdrawn, replaced by 25066 from Eastfield. It's September 14th 1980 and 25026 idles at Millerhill. In a matter of days it will be transferred from Haymarket to Toton, where it will be withdrawn soon afterwards. 25026 had been delivered from Darlington Works during the bitter winter of 1962/63, its last winter would see it move to Swindon, where it was broken up during March 1981. The New Year opened with little better news, 25118 was withdrawn in January & stored at Toton, two more Class 25's arrived. February found 25094 & 25267 withdrawn, covered by Scottish transfers 25050 & 25235. Up until its withdrawal 25094 had been the most transferred locomotive on BR, with a total of twenty eight moves, that honor now passed to 25093 with twenty six moves. The Mountsorrell - Elstow stone working, previously a solid Class 25 turn was now featuring pretty much anything that Toton might have available. On Easter Monday a Melton Mowbray - Southport excursion featured 25081 & 25066 (TO), whilst April 27th's 11.19 Wellingborough - Acton had 25101 & 25066. Transfers in March & April were minimal, just Toton & Cricklewood shuffling their Type 2's around, 25118 & 25185 were stored at Toton. May however did bring bigger changes, 25107 was withdrawn whilst Toton sent eight Class 25's to various LMR depots. May 16th found 25073 & 25134 on an Old Hill - York school special, whilst May 25th 25066 & 25050 handled a Leicester - Llandudno Bank Holiday extra. High summer saw Toton's dwindling fleet still criss-crossing the country. On July 26th a Birmingham - Aberystwyth charter had 25164 & 25130 (TO), whilst on July 31st the 13.30 FO Reading - York utilised 25268 (TO) & 25285 north of Birmingham. The working was extended to Newcastle with the Class 25's returning south next day on a Newcastle - Poole relief. During August Toton sent two more Class 25's to Cricklewood, on 17th a Banbury - Aberystwyth charter featured 25242 & 25268 (TO). The Birmingham - Norwich services saw an unusually high level of Class 25 activity, with a number of Toton machines represented. Elsewhere the early morning Ditton - Sheffield (Broughton Lane) BOC tanks featured 25321 (TO) & 40171 on August 20th, the same pair also handling the westbound empties. The end of the summer timetable brought only one withdrawal, 25073 in September. Sixteen Class 20's went into store at Leicester, and an omen of things to come was the transfer of 31149 from Tinsley to Toton. A great shortage of electric locomotives on the souhern end of the WCML saw many diesels filling-in, including many Class 25's. In the remaining months of 1981 Toton and Cricklewood continued to play ping-pong with their Class 25's, although 25123 moved over to Crewe in October and withdrawn were 25280 (Nov) and 25125 (Dec). By the beginning of 1981 major inroads are being made into the Class 25 fleet, the WR no longer has any whilst the ScR have considerably pruned their allocation. However on March 14th 1981 25048 is in fine fettle at Toton, leaving its mark on the yard. The hinged ventilators indicate this is a dual-braked machine. 25066 and an impressive looking snow plough, July 29th 1981. 25066 came south to Toton during January 1981, part of the great shuffle of locomotives at this time. Its usefulness here was brief, by June 25066 was retired and carted off to Derby Works for breaking up. In this August 1st 1981 view the locomotive is already withdrawn, though the bodywork certainly presents a serviceable image. Seen here on March 14th 1981 25123 awaits entry into the servicing shed. This is one of the Class 25's that had its boiler room grilled sheeted over. The solitary Class 31 on Toton's books at the end of 1981 would not remain alone for long, the first quarter of 1982 saw an infestation of Class 31's, eleven coming from various ER depots with seven of these re-instated from storage. Against this onslaught the Class 25's continued their increasingly rapid demise at Toton, 25129, the favourite of Northwich crews from her ICI days was withdrawn during February. More ping-pong took place with the Toton/Cricklewood allocations, whilst an arrival from Kingmoor was 25097. Stored at Toton during February was 25125/149 & 25280. On February 12th a brief spell north of Carnforth found the Heysham - Leith pipe flats in charge of 25190 (TO) & 25191, whilst the Shap - Tebay - Carnforth ballast job had been allocated to 25186. As if the dismal wreckage from the ER supposedly impersonating Class 31's wasn't enough, April saw the WR sending some of their finest junk 31's to Toton, with four arriving. Going in the opposite direction on April 26th were 20068/088, 25125/149 moving from Toton to Swindon for storage/breaking up. Fleeing from Toton during April were 25132/133, finding temporary accomodation at Longsight & Kingmoor respectively. As if to confirm this flight to the north-west, 25067 handled the 9.42 & 17.42 Manchester Victoria - Bangor and 13.38 return during April. The summer timetable, introduced towards the end of May found the Nottingham - Llandudno diagrammed for Class 47's, usually no-boilered. On May 30th an intensive shuttle service was operated between Manchester Victoria & Blackpool for the Pope's visit, 25130 was amongst the locomotives used. Transfer activity during the summer was minimal, only 25235 moving to Springs Branch in May. A mainline outing for 25313 took place on August 13th when it assisted 45138 on the 08.28 St Pancras - Nottingham service. 25318 joined the storage lines at Toton in August. Another visitor on the Manchester Victoria - Bangor service was 25248 on a late afternoon working on September 13th. As expected the end of the summer timetable brought more grief. HST's commenced operating on the Midland mainline, the first Class 58's were beginning to roll out of Doncaster Works and March sent over a further five Class 31's to Toton. Two more Class 25's left Toton, 25134/135 going to Bescot. 25318 remained stored at Toton whilst Scotland lost its final allocation of Class 25's. Things perked up a little in November when 25133/53 returned to Toton, however their usefullness was offset by the withdrawal of six more (25139/143/186, 25248/270), their loss was covered by the arrival of five more Class 31's. 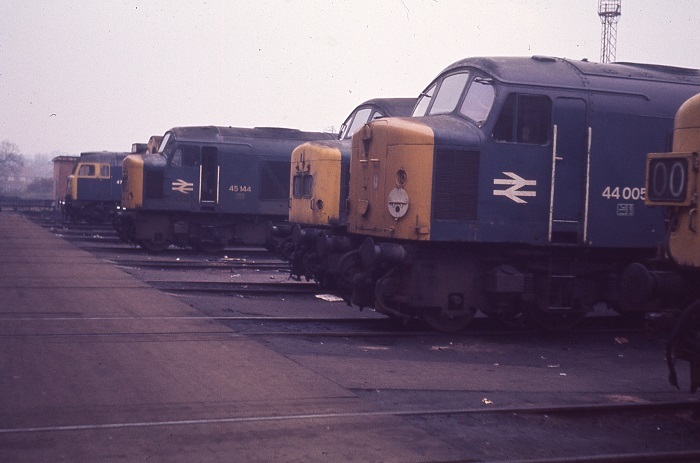 Toton's fleet of Class 31's now numbered thirty one, many having been removed from storage and put through a major repair at Doncaster Works during 1982. 45075 on August 28th 1982 illustrates very well the capacity of Toton to handle heavy repairs, in this case using four twenty ton screw jacks to allow removal of the bogies. In the view below similar attention is being given to a Class 25. 25093 undergoes some heavy maintenance on September 18th 1982, requiring jacks to raise the body, giving access to the bogies. The Achilles heel of the Class 25's were its traction motors, its smaller motors (as compared to the Class 24's) were a weight saving measure that was perhaps not justified in the long run, especially in light of the higher maximum speed demanded of the 25's. 25207 had spent some time allocated to Toton in the early 1970's. Seen here at Toton on May 22nd 1982, 25207 will run until November 1984, then lingering until the summer of 1987 when Vic Berry will do his job. A fine late summers day, September 18th 1982 finds 25210 dropping down onto the depot. 25210 - 25212 were on allocation at Toton during the mid 1970's. 25210 spent eight years at Toton (Nov 1970 - Nov 1978) before moving south to Cricklewood, then on to Crewe before withdrawal in April 1985. The winter of 1981/82 was particularly severe, especially in January 1982. Much of the country was plagued by heavier than normal snowfall and freezing temperatures. Seen here on January 9th 1982 25211 keeps company with some snow caked Class 56's. 25211 would survive four more winters before withdrawal from Crewe in July 1986. Despite its battered appearance, seen here November 13th 1982 25213 will survive until the final demise of the Class 25's during March 1987. Although principally an LMR allocated machine, 25213 spent time at Tinsley and Eastfield. Surrounded by the ever present piles of brake blocks 25265 awaits attention on May 22, 1982. This would be another of the Class 25's to run until their final demise during March 1987. And Vic Berry would not have this one, preservation beckoned for 25265. The New Year opened to more crud arriving from the WR, four that were operational and two just pulled from storage. A tragic irony was the use of Toton's 31204 by the authorities at Willesden to train crews on these machines, following its visit here, the Class 31 was used by Rugby, Northampton & Bletchley for training. The rot had now set in on Cricklewood's Class 25 fleet. By the end of January 25095, 25133/136 had moved on to other LMR depots. On February 12th 25058 & 25136 (TO) hauled the 09.03 Cambridge - Birmingham New Street. Similarly 25303 hauled the 07.40 Norwich - Birmingham New Street on March 1st. Tinsley was finally rid of withdrawn 25056 when it moved south to Toton on March 9th with the help of some wheel skates. Already stored at Toton were 25090, 25131/139/151, whilst by the end of March six more Class 25's were gone, 25117/152 to Cricklewood & 25153/190, 25302/303 to Crewe. May brought more transfers, ten Class 20's moved in from the Scottish Region, allowing Toton to send eight Class 31's to the unfortunate Bescot depot. A small tradition ended at Coventry on June 13th when the regular stabling of main line locomotives ceased there, 25190 was the last to be stabled there, after working its daily duties it returned to Nuneaton for overnight stabling. The stored Class 25's at Toton continued to be 25056/090, 25131/139/151. July brought the transfer of 25315 to Crewe, whilst on July 11th 25097 worked the Preston - Liverpool leg of the 18.20 ex Glasgow. A re-numbering for one of Toton's stored machines occurred in July when 25131 became 97202, for 'test duties' by the CM&EE at Toton. October saw 25308 withdrawn, being stored at Crewe, whilst in November 25097 succumbed and finally, the last Class 25 allocated to Toton, 25119 moved to Crewe. Ironically as Toton lost its last Class 25, so Tinsley was also freed from its allocation of Class 31's. The rot continued elsewhere however as 31156 was loaned to Cricklewood for crew training. Without an allocation the story ends here, though until March 1987 Toton would continue to be visited by the dwindling Class 25 fleet. It would also be home for a number of stored machines. When I have the inclination I will complete the notes for 1984 - 1987. All errors, omissions, spelling mistakes and vicious attacks on Class 31's are all mine. Quite a well travelled machine 25236 is seen here on June 18th 1983, whilst allocated to Kingmoor. 25236 was a March 1964 delivery from Darlington Works, spending its years on BR operating from ER & LMR depots. In the first half of 1965 Derby Works was delivering about six Class 25's a month to Toton, during March one of those was D7535. Although withdrawn from Crewe in November 1984 25185 is seen here at Toton on March 23rd 1985, used as a training tool! Its June 3rd 1984 and 40169 is at Toton to provide spares for 40122. By the end of the year 40169 will be no more, having been towed away to Doncaster Works and broken up. Withdrawn from Cricklewood in December 1982 and stored at Toton, 25131 is seen here on June 3rd 1984 as CM & EE training vehicle 97202. 25325 at Toton on March 23rd 1985. 25325 was taken out of service at Leeds Holbeck and was moved to Kingmoor for storage. It's last trip was to Glasgow late in November 1988, where it was broken up by MC Metals durings February 1989. Its March 15th 1986 and 45010, 25080, 46023 & 45001 form part of one of deadlines of locomotives that formed at Toton from time to time. 25032 at Toton on May 18th 1988. 25032 was taken out of service in March 1986 at Holbeck, moved to Toton where it lingered for a while prior to meeting its end at Vic Berry's Leicester during December 1988. Two years have gone by since the very similar 1986 view above of 45010 in the deadline. The vandals and graffiti merchants have left their mark, the yard is now unkempt and the tracks on the left are now sectioned. June 5th 1988. A close up of 25209 at Toton on May 10th 1991. 25209 had been withdrawn back in December 1985, being stored at Toton where it would slowly rot away for the next five years.